The schedule of events for the 2019 World Championships has been posted. Taking place in Vienna, Austria, from Thursday, August 8th through Sunday, August 11th, the weekend features ten (10) different First Edition tournaments across multiple formats. Aside from the First Edition World Championship itself, notable events include a Reflections-box sealed event, the "Cool" tournament, and the potential for surprise pre-release tournament. We hope you can make it! Last week, we took a look at Brian Sykes' (Armus) winning deck for the Trek Master Series in Manassas Park, Virgina. This week, we'll take a look at the rest of the field and dive a little deeper into the metagame of the year's first high level event. First of all, decks based around the 22nd century factions were the most popular choice, and did well overall. Aside from Brian's winning Vulcan decks, decks claimed the 4th, 5th, and 10th places. 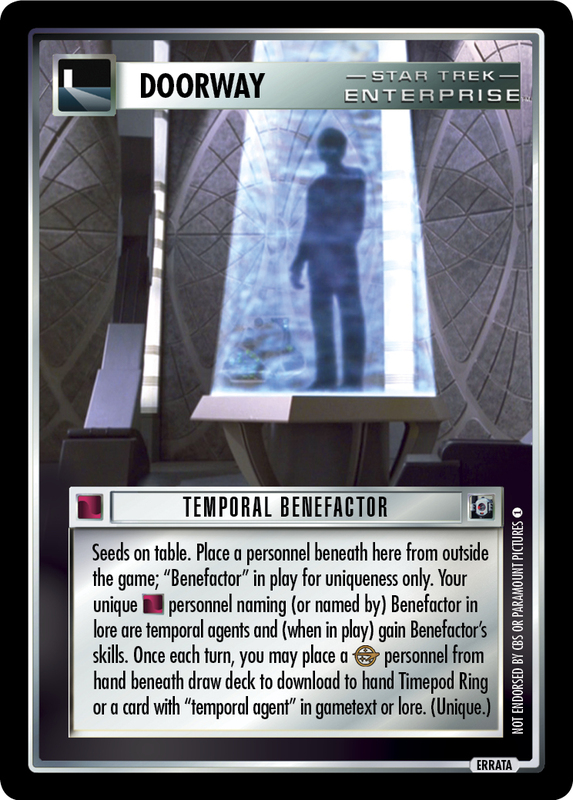 Each of the decks that have been posted used the now-errated Temporal Benefactor, though from what I can tell, this errata would have only had a marginal effect on the decks. Michael Van Breemen's (The Ninja Scott) 5th place / deck was the only one (of those posted) that didn't use Temporal Almanac; in fact, he didn't use any deck-base drawing engine. The field was as diverse as any I've seen; across the decks that are posted, only , , , and were repeated, and only one time each. A deck came in second place, and likely that came down to Brian's use of Quinn in his game vs Lucas. I have long advocated for event/interrupt prevention in First Edition, especially as a counter to aggressivly fast decks. It's a risk, because it slows your deck down and can cost you points, but any good midrange or interference deck can handle that risk. And, as Brian demonstrated here, it can be a tournament-winning play. Most of the top decks came to fight, with the notable exception of Lucas' TNG Federation deck titled Nostalgia 2: The Second Part. As several players mentioned, a big strength of Lucas' deck was the dilemmas, including the extra two he brought due to being seed light. Having solid and difficult combos, including some unexpected choices, can go a long way towards buying a deck that can't battle extra time. But battle is definitely a winning strategy, as all of the other Top 8 decks show - if you can't beat 'em, blow 'em up. Overall, I think this event shows that the metagame supports multiple different affiliations as viable options. However, I think it is pushing all players to either play direct solvers that can win as quickly as possible, or midrange decks that solve missions with the ability to disrupt direct solver decks. I'm not sure that is as dominantly "broken" as has been hypothesized, but they have so many strengths (and few weaknesses) it is something to look to adjust in the future. Good deck design and good play decisions can carry players to the top, or cost them championships - and that's just how it should be. I hope we'll see a spike in use of cards like Quinn, Kevin Uxbridge, and Amanda Rodgers as the season unfolds. Which player are you most worried about? Joshua Sheets (prylardurden): Probably MVB. He has a history of playing deck with one weakness and if you don't cover that weakness, he usually gets the win. Austin Chandler (DarkSabre): Never played against MVB and he has played against a lot of top players. It'll be something new to play against him and that's the one I am worried about the most. Robin Honeycutt (robin1234): Michael - never played him before. Brian have played twice and never beat him yet. Lucas Thompson (edgeofhearing): I haven't played against most of the field, but the only time I've ever won against MVB is when I was playing his deck and he graciously taught me how to beat him with it (after he was knocked out of contention anyways). Michael Van Breemen (The Ninja Scot): Not wanting to sound cocky or anything like that but I'm not worried about anyone who's attending. Which deck (regardless of who plays it) are you most worried about? Joshua Sheets (prylardurden): Would have to say KCA, simply because I haven't played against it that much and still have to figure out the various options it has. Robin Honeycutt (robin1234): Dominion slasher deck. Lucas Thompson (edgeofhearing): First Edition Borg makes me enter a helpless, catatonic state, and then I lose. Actually, the same is true of just about any First Edition interaction-based deck, but at least I understand why I'm losing against non-Borg decks. Bruce Parrish (Captain Parrish): I'm most concerned about facing the Borg. I'm still relatively weak playing against them as I don't understand all of their constraints and well strengths. Michael Van Breemen (The Ninja Scot): I don't like dealing with battle in general but we'll see what happens. Two different First Edition tournaments took place this weekend, and we'll start with the one in Austria - host to this year's World Championships, as mentioned above. Tournament director Stefan Slaby (Winner of Borg) played a Federation/Hirogen/Vidiian deck he called Love and Peace and Holes to a win with three modified wins - a long day! 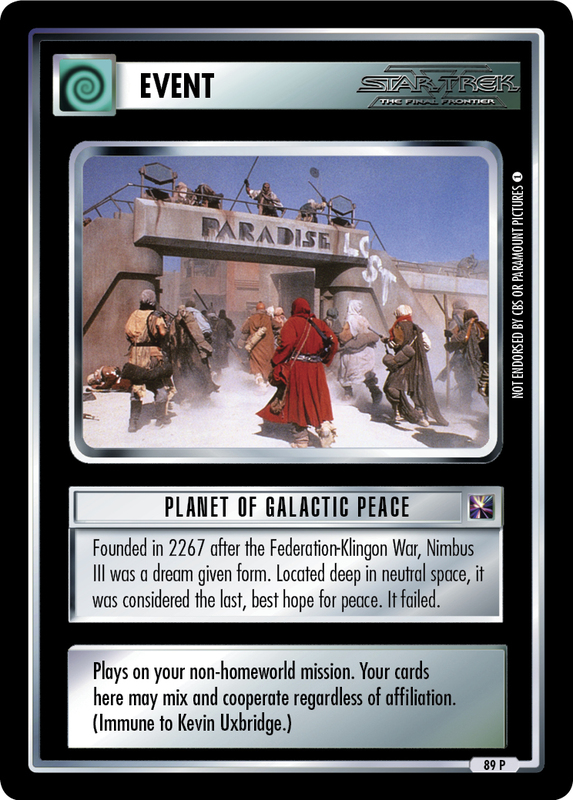 This is one of the more interesting decks I've had the chance to look at, as Stefan has mashed together most of the different play engines into a single deck, using Planet of Galactic Peace to allow his crews and Away Taams to work together. He also took advantage of the unbanning of Black Hole to use them in his deck as well, though he wasn't sure it was a good decision. In the rest of the field, Michael Albrecht (Ein Gast...) played some flavor of Federation to take the silver medal, while Martin Felber (Enabran) and Julius Melhardt (Clerasil ToB) rounded out the day. Both of the posted decks are , so if you're looking to play in Voyager's backyard, these are good decks to start with. Meanwhile, at the Lock Yark in Brooklyn, New York, host Christopher Ghiorzi won his four player tournament. These small events have been a fixture at his restaurant/bar, and feature mostly new players to the game. I reached out to Christopher to ask him some questions about his group, and how he found the game; here's what he had to say. How did you get into playing First Edition? I am definite newbie to the game but I have been a Star Trek fan forever. When I was young, my mother would take my sister and I to a convention every now and again; very good memories associated with those trips. As a 10 year old I was into collecting cards and it was at that point I got my first STCCG cards BUT I never played with them. I played Magic for a long time, but not seriously. It was only recently when I started to take over the restaurant (Lock Yard) that I wanted to do a regular game night there that I started to gravitate toward Trek CCG. I am a nutty Star Trek fan boy and when I found out there was an entire community of people out there playing tournaments and having get togethers based around a Star Trek game I needed to see if I could get a group together to be a part of it. How did you find The Continuing Committee? The almighty Googles brought me here. Are the members of your playgroup previous friends of yours, or are they like-minded others? They are all friends that I at one point suckered into trying out the game. At first I think everyone was a little skeptical. The learning curve of the game is a little insane, but once everyone got going I think we are on the same page of excitement. The winner of our previous tournament, Julia (Jules), isn't even a Star Trek fan, has not seen one movie or episode, but she loves the game! Do you play with virtual cards? I do not. Wouldn't know where to start with the virtual stuff, also the game is a very social thing for my group and I. I would say everyone has at least 2 beers in them before they throw down their first card. What has been the biggest help in getting tournaments up and running? By FAR the biggest help to the Lock Yard group getting off the group running was the tutelage of 2 CCG veterans from Buffalo, New York. Robin Honeycutt (robin1234) and Mark Panna (Shambinks) both made the long trip from Buffalo to Brooklyn to get in on our first tournament. It wasn't so much a competitive venture but a clinic. Both Robin and Mark showed a lot of patience with us newbies. Since then it has been much easier to address the official rules and for all of us to start concentrating on deck creation. What more could the CC do to help support your group and others like you? I can't think of an answer to that. Every time I have reached out to anyone at the CC I have been met with quick response and open arms. At first I thought that the CC would be a closed off entity, not so much open to new players from new places. I was so completely unfounded in my anxiety, everyone has been awesome; I don't think the CC could have done anything to make it easier for my group to get set up and into the swing of things. I look forward to meeting more players and organizers from the CC in person. I know I speak for everyone here Christopher that we're glad to have you. If you, or anyone else out there reading these, needs any help - don't hesitate to reach out. Meanwhile, if you played in any events, scheduled or unscheduled, formal or casual, let us know! Send me an email or a private message, and I'll be happy to advertise your event or games to the world in a future column. My contact information is at the bottom of every column each week. With no regular events scheduled for this weekend, let's dive a little deeper into our upcoming championship events. "Spring Break Masters" will be in San Diego, CA on Saturday, March 30th. Last week, I shared with you the nature of the "Silver Tin" draft event; it's quite different than the bare knuckle constructed 1E we saw last weekend in Virgina. And if any of the preregistered players know sealed, it's Director of Organized Play Kris Sonsteby (LORE). Kris is a huge fan of sealed and the quicker and more skill testing games it tends to provide. Draft, in particular, requires players to not only keep track of what picks they are making, but what picks their opponents make - as picks are made publicly. Kris, and the others, will need to know who took the Cytherians as well as who took Jean-Luc Picard. As one of the Top 10 1E players in the world, Kris has proven his constructed bona fides - can he prove he has the chops to win the Silver Tin draft as well? Kris is just one of six (6) players preregistered for the fun in San Diego, and we'll take a look at more players in future columns. We've got two 1E regionals to kick of the season, both the second weekend of April. In West Melborne, Florida, our Director of Communications Daniel Matteson (OKCoyote) is hosting an OTF Complete Constructed regional. Aside from himself, fellow Floridian Sean O'Reilly (Jono) has preregistered for his chance to claim a Borg Queen foil. Meanwhile, on Sunday of that same weekend, Rules Mananger Jon Carter (pfti) hosts an OTF Legacy Constructed event in Ypsilanti, Michigan with five players preregistered at this time. Not only does this event include multi-champion David Bowling (tomek) and 3rd ranked Jon Carter, but Robin Honeycutt (robin1234) will be looking to reestablish his streak after a tough loss at the Trek Masters Series event in Virgina. That's going to be an event to watch! Should players be able to "bug out" of a dilemma with special downloads? This tactic has generated some significant discussion on the forums about both how it works, and if it should be something that remains legal. 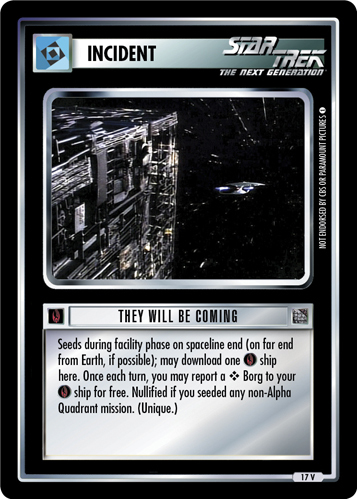 If you aren't familiar, the idea is that you use a special download [DL] of a card like Out of Time or Incoming Message - Federation to "bug out" a crew or Away Team from a dilemma that they can't overcome. Because the special download suspends play, it allows these cards to be played even when they ordinarily wouldn't be able to be played. What do you think of this tactic? Let us know. Who played that cat? For decades, curious and obsessive Star Trek fans have been unable to identify the woman who played Isis the Cat from the original episode "Assignment: Earth." Gary Seven, an extra-planetary secret agent, kept a pet cat with him that, at one point, took the form of a beautiful and silent woman; however, the actress was uncredited until recently. Finally, after combing through Gene Roddenberry's files, she has been identified as April Tatro. Mystery solved! "The Savage Curtain" aired fifty (50) years ago this week. This third season episode of Star Trek pit Kirk, Spock, Abraham Lincoln, and Surak against the forces of evil - Kahless, Colonel Green, Ghengis Khan, and Zora. More recently, this episode is the inspiration for the two Will of the Collective VI cards, Excalbia (the mission) and Yarnek (the personnel). Speaking of which, they are finishing up today, so soon you'll get the chance to sign off on the finished cards before the head off to proofreading. What would you like to see happen? I've posted a straw poll with a few different ideas for programs or projects that might happen. Take a look, and sound off about anything that you'd like to see. Your feedback will be valuable in helping the Department of First Edition decide what to work on next! Assign Mission Specialists (1) held off a small but respectable rally from Hippocratic Oath to keep alive, 71-29. In spite of the two cards being so closely seeded, Space-Time Portal (16) dominated Ready Room Door (17) with an 81-19 win - the first of several with that score. In one of three major upsets, Battle Bridge Door (40) defeated Rules of Obedience, 81-19. Also by an 81-19 margin, Cytherians (9) ended the hopes and dreams of The Cloud (41). In a statistically unlikely fourth consecutive game, Q's Tent (4) defeated Temporal Micro-Wormhole 81-19. In a huge upset, New Arrivals (45) ended Medical Crisis (13) with a 62-38 victory. Edo Probe (28) kept their hopes alive with a 67-33 win over Scientific Method (60). Denevan Neural Parasites (21) knocked out Gomtuu Shock Wave (53), 67-33. Dead End (2) routed Assign Support Personnel, 71-29. In a close match for the ages, Captain's Log (48) narrowly won out over Founder Secret (50), 52-48. Alternate Universe Door (7) survived a credible challenge from "God" (39) to stay alive, 57-43. I'm a Doctor... Not a Bricklayer (42) had the moves and the deep bench necessary to beat Faux Pas (55), 67-33. In a close match, Defend Homeworld (3) eeked out a win against Masaka Transformations with a 57-43 win. In the biggest blowout of the round, if not the tournament, Lower Decks (14) shellacs Containment Field (19) 95-5. Friendly Fire (6) narrowly avoided elimination with a 52-48 win against HQ: Secure Homeworld (38). Lack of Preparation (43) destroyed heavy-favorite Temporal Conduit (11) with a 81-19 upset. That means we're down to the Round of 16, and the choices will get tougher as we march towards a single First Edition survivor! Make sure to cast your votes to decide which cards advance, and which are banned forever (not really). Remember, each round you vote is an entry into a random drawing for a complete set of Tournament Promo Series N!